An extract from an article originally published on notquitenigella blog, Friday July 29, 2011. It’s a four hour drive including pit stops and shopping stops but we have a little treat in store for our first stop once we get there. It’s always nice to unwind after a long drive and if unwinding was at a spa then all the better. Off to Cupitt’s Winery for lunch! 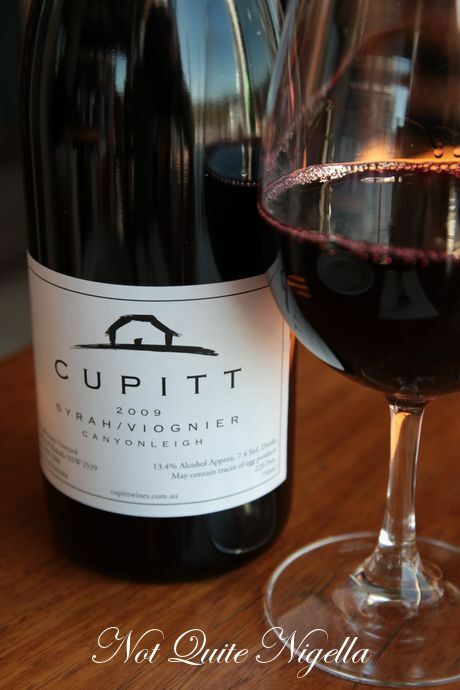 Cupitt’s Winery is a winery known for its food and wine which is made in an underground cave that sits right underneath the restaurant. Outside the restaurant is an Italian motorbike and a side car. 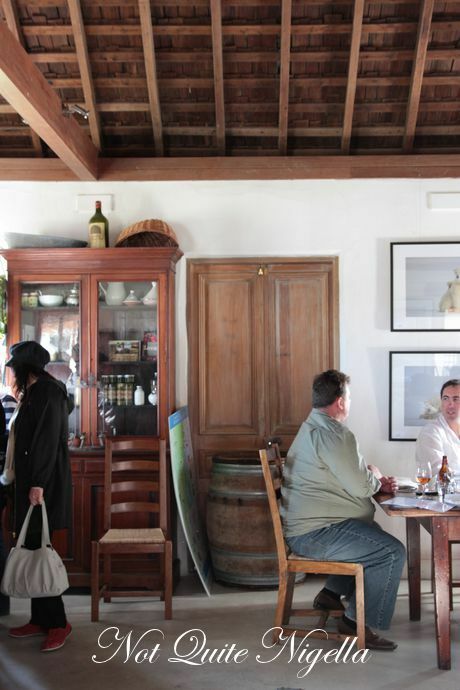 We take a seat, the fireplace is roaring and the chefs are already busy at the open kitchen. I’m in a soup kind of mood so I choose a soup to start with. The soup is piping hot and I do mean piping hot. We have to wait about 10 minutes for it to cool down and when do we get a flavoursome mouthful of onion soup with finely-sliced, soft onions. It is like a lighter version of French onion soup sans the gruyere croutons, the cider is light in this – in fact we couldn’t really taste it. 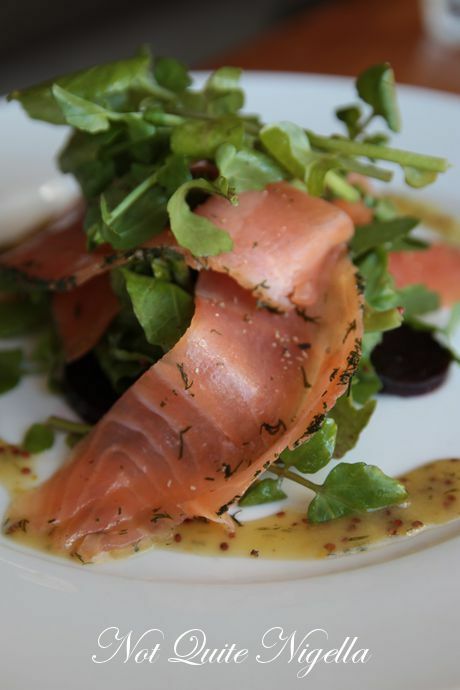 The salmon is excellent with a good complement of flavours to the silky house cured salmon slices. It comes with slices of kipfler potato and thinly sliced roasted beetroot and a sweet, mild mustard and dill vinaigrette with the rocket. 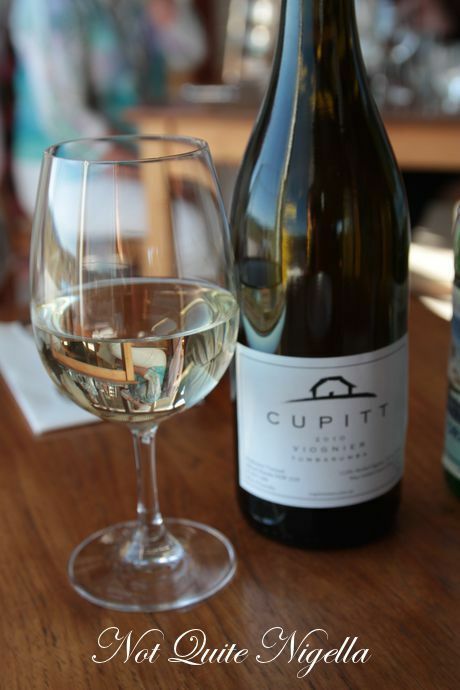 Mr NQN tries some of the 2010 Cupitt’s Viognier Tumbarumba and loves it so much that he goes next door to the cellar door to buy a bottle. 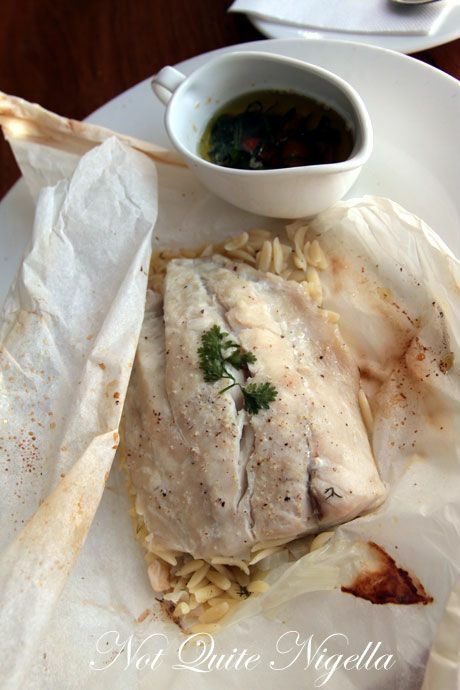 I do like fish cooked in paper as it always retains a moist texture as it does here. It is served with a sauce vierge which is a herby sauce made with olive oil and there is fennel and orzo as well as tomato and herbs. I did find that this could have done with some lemon or additional flavours to it although the fish itself was juicy and moist. This was a very generously portioned serve of the venison. Our waitress told us when we ordered it that it was served rare which was fine by us but it was really served medium when we got it rather than rare. 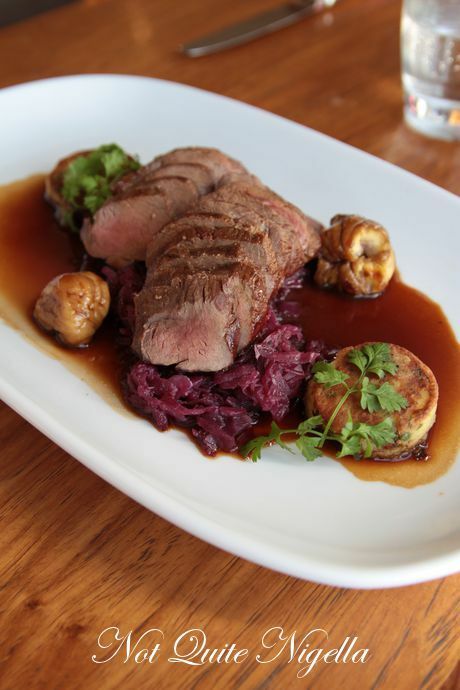 Venison is really at its best when it is served rare though. The red cabbage is a nice acidic accompaniment as is the juniper berry sauce. There’s always room for dessert (that lovely “dessert stomach” phenomenon of course) so we opt for a dessert that caught my eye as soon as I saw it on the blackboard: the local organic pear and apple crumble with vanilla ice cream for two. 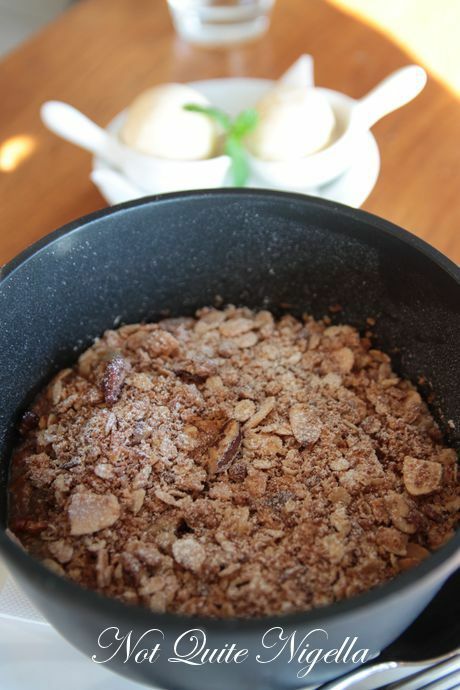 It comes out in a black cast iron pot and is filled with delicious soft baked cubes of apple and pear with a crumble crust with pecans, almonds, oats and coconut and a lovely vanilla bean ice cream. If only I could have absconded with this and eaten this in the comfort of our room late at night at Meadowlake Lodge!